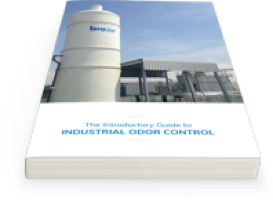 Effective removal of odorous and polluting compounds from water with a wide variety of applications. 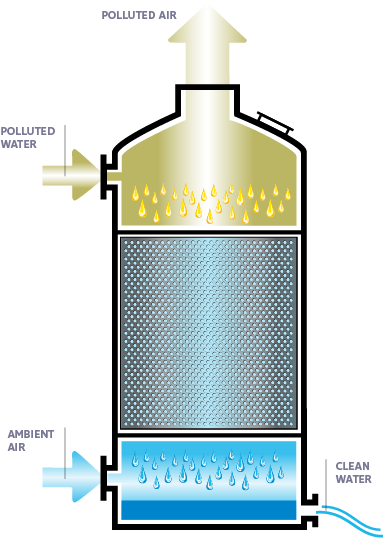 The result of the process is clean water, which is collected at the bottom of the vessel and then drained away via a sump. Depending on the type of facility, this water can be reused or directed to other processes, significantly reducing the release of wastewater and increasing facility efficiency. As the impacted water falls through the random media, it’s converted into very small droplets. Meanwhile, ambient air is pumped upward through the media from the bottom of the vessel. This allows mass transfer of offending compounds to occur—essentially, offending compounds concentrated in the water droplets jump into the air molecules to achieve equilibrium. 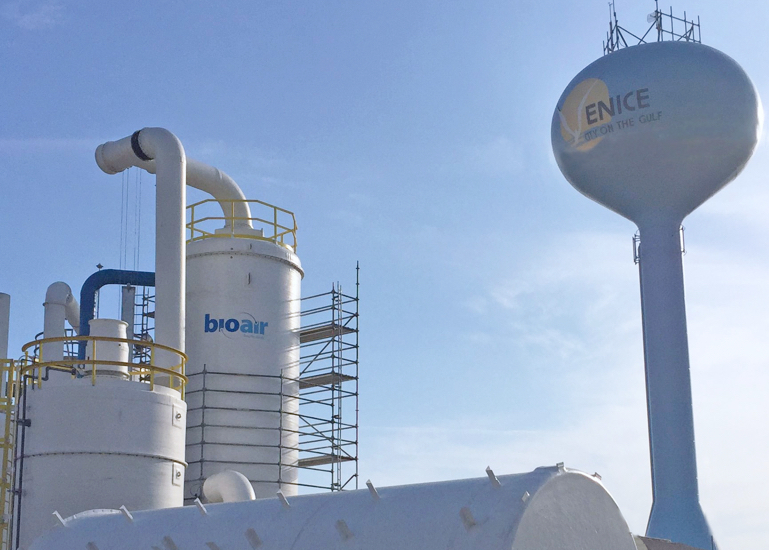 If necessary, BioAir can provide a downstream air treatment system to ensure that your facility’s air is as clean as its water. Based on the treatment design basis we develop for your site, BioAir first incorporates the Rainfall system into your site’s water treatment infrastructure. Then, the water is pumped to the top of the Rainfall degasification chamber, where it is poured over random media with high capacity for mass transfer. Best mass transfer efficiency on the market. Purely physical process requires no chemicals. Sustainability is improved with water reclamation. Easy to operate and affordably maintained. BioAir’s Rainfall systems are popular components of larger treatment systems at municipal water and wastewater treatment plants. However, these systems are well-suited for use in any setting where water treatment is necessary, particularly in industrial oil and gas facilities. If we believe your water treatment needs will be addressed by a Rainfall™ system, we’ll recommend it regardless of your industry.